There are 25 names in this directory beginning with the letter M.
A public civil officer, invested with some part of the legislative, executive or judicial power. In a narrower sense, the term includes only inferior judicial officers, such as justices of the peace. A court that has minor civil and criminal jurisdiction. Latin term meaning "we command." A writ issued by a court ordering a corporation, officer, or inferior court to perform an official act or duty required of it by law. For example: A state legislature passes a law which provides that, upon request, a person has the right to see any information the government has on file for that person. Kathy files such a request with the state's attorney general and is refused access to her information. Unless the refusing party can show some compelling need for secrecy, a court will issue a writ of mandamus to holder of the records, directing that person to release the information. The doing of a wrongful and unlawful act; any wrongful conduct that interrupts or interferes with the performance of official duty. The state of mind that accompanies the intentional doing of wrongful act without justification and in wanton or willful disregard of the plain likelihood that harm will result. A professional's improper or immoral conduct in the performance of his duties done either intentionally or through carelessness or ignorance; commonly applied to physicians, surgeons, dentists, lawyers and public officers to denote negligent or unskillful performance of duties where professional skills are obligatory on account of the fiduciary relationship with patients or clients. A judicial command; an official mode of communicating the judgment of the appellant court to the lower court. Unlawful killing of another person without malice aforethought; distinguished from murder (and its possible attendance death penalty) as an explainable, less extreme homicide. Most jurisdictions distinguish between voluntary and involuntary manslaughter. Voluntary manslaughter is intentional killing committed under circumstances that, although they do not justify the homicide, reduce its evil intent. A charge of manslaughter is appropriate where the defendant killed the victim in rage, terror or desperation. Involuntary manslaughter consists of a homicide resulting from criminal negligence or recklessness. Law of military necessity, where the military exercises great control over civilian affairs, generally because of war or civil insurrection. When instituted, marital law represents the unchecked will of the commander, controlled only by consideration of strategy and policy. In the United States the president, as commander in chief of the armed forces, would assume unreviewable discretion were marital law declared. One who can give testimony that might have bearing upon the outcome of a cause and that no one else is able to give. In criminal law, the term refers particularly to a witness about whom there is a reasonable expectation that he or she can give testimony bearing upon the defendant's guilt or innocence. A traditional body of rules and practices related to business transacted at sea or to navigation, ships, seaman, harbors, and general maritime affairs. It is, and always has been, a body of law separate from every other jurisdiction. An informal discussion of the merits of a matter pending in a lawyer's office usually written by a law clerk or junior associate for a senior associate partner. Also called an Office memorandum. An argument by an advocate in support of his or her position; like a brief but less formal. 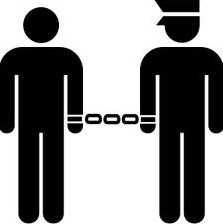 The requirement to inform a person of his privilege against self-incrimination (right to remain silent) and his right to the presence and advice of a retained or appointed attorney before an interrogation by law enforcement authorities. Prior to any questioning, the person must also be warned that any statement he does make may be used as evidence against him. Statements and evidence obtained in violation of this rule, unless these rights have been knowingly waived (and the evidence voluntarily provided), are not admissible in the defendant's criminal trial and are grounds for federal constitutional challenge to any conviction obtained thereby. Damage to the rights of one party to an action that results from errors made by the court during trial and that is sufficiently substantial to require reversal. A crime, less serious than a felony, punishable by no more than a year in jail. Petty theft of articles worth less than a certain amount, is an example of a misdemeanor. The wrongful or injurious performance of an act that might have been lawfully done. A trial that has been terminated and declared void prior to the jury's returning a verdict (or the judge's declaring his verdict in a nonjury trial) because some extraordinary circumstance (such as death or illness of a necessary juror of an attorney), or because of some fundamental error prejudicial to the defendant that cannot be cured by appropriate instructions to the jury (such as the inclusion of highly improper remarks in the prosecutor's summation), or most commonly because of the jury's inability to reach a verdict because it is hopelessly deadlocked in its deliberations (hung jury). Mistrial does not result in judgment for any party, but merely indicates a failure of trial. A set of conditions that, while not exonerating the accused, might reduce the sentence or the damages arising from the offense. Latin term meaning "the manner of operation." The means of accomplishing an act, especially, the characteristic method employed by a defendant in repeated criminal acts. A fictitious court established to argue hypothetical cases. Law schools form moot courts as an instrument of learning. In common law, a conveyance of, or granting of a lien upon, real property of a debtor to his creditor, intended as security for the repayment of a loan, usually the purchase price (or part of thereof) of the property so conveyed or encumbered. An application to the court requesting an order in favor of the applicant. Motions are generally made in reference to a pending action and may be addressed to a matter within the discretion of the judge, or may concern a point of law. Motions may be made orally or, more formally, in writing. A lower state court with jurisdiction over criminal misdemeanors. In many states a felony criminal will first be filed in Municipal Court and then subsequent to indictment be transferred to Superior Court for felony arraignment. Misdemeanors remain in Municipal Court through trial. Unlawful killing of another human being with premeditated intent or malice aforethought. First degree murder is an unlawful killing that is deliberate and premeditated. Second degree murder is unlawful killing of another with malice aforethought but without deliberation and premeditation. Such malice may be in the form of express malice as the actual intention to kill, or of implied malice where there is no intent but, where death is caused by an act which discloses such reckless state of mind as to be equivalent to an actual intent to kill.